We’re a group of engaged and curious thinkers who understand that ideas matter. The Center for Humans and Nature partners with some of the brightest minds to explore human responsibilities to each other and the more-than-human world. We bring together philosophers, ecologists, artists, political scientists, anthropologists, poets and economists, among others, to think creatively about a resilient future for the whole community of life. Founder and first president Strachan Donnelley shares his vision for the Center for Humans and Nature. 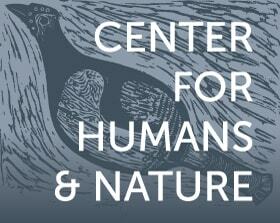 The Center for Humans and Nature connects people with ideas through big Questions, our journal Minding Nature, our City Creatures Blog, and special Events. Across the world, people are striving for fairer and resilient economies, truly democratic cultures, and healthy, thriving communities. Along with our network of Contributors, the Center offers diverse ideas on how transforming humanity’s relationship with nature can inform our responses to these interconnected challenges. You can help by weighing in with your thoughts and contributing to our growing community of thinkers. Our Avatar represents an important piece of the Center’s story. This grouse 'head shot' is taken from a print of a wood engraving by the contemporary artist Ansell Bray. The engraving was inspired by a 19th century Makah grouse rattle. Connected to the land that is now Washington State, the Makah would have used this rattle during secular tribal ceremonies. The Center’s founder, Strachan Donnelley, loved the rattle, the engraving by Bray (a friend of the Donnelley family), the print, and the many interconnected meanings they encompassed. Together, they express the complex interfusion of humans and nature, cultural understandings, social practices—both past and present—including artists, their natural subjects, and their mediums. Our Avatar is a manifestation of these meanings, as well as a symbol of Strachan’s vision for the Center for Humans and Nature.